This is volume three in Sherlock Holmes and the American Literati series. Mark Twain meets Sherlock Holmes! My thanks go out to Steve and Timi at MX Publishing for my copy of this book. May Undershaw stand forever! This novel is a retelling of “The Problem of Thor Bridge.” The tale is expanded and has a slightly different slant than the original. J. Neil Gibson, The Gold King is accompanied to 221B by Samuel Clemens, AKA “Mark Twain.” In fact, Twain has recommended Holmes to his friend, and when the man bolts from Baker Street it is Clemens that brings him back. 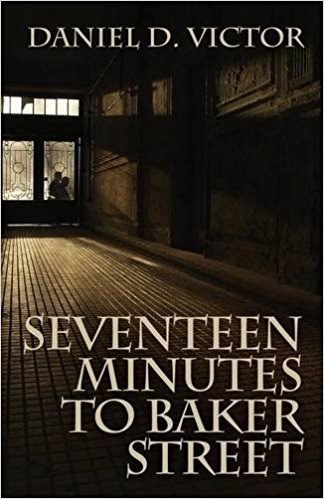 The title is drawn from Clemens’ statement of how long it takes him to get to Baker Street from where he and his family are staying. Holmes’ short story “A Double-Barreled Detective Story” and Bret Harte’s “The Luck of the Roaring Camp” and “The Missing Cigar Case” are featured in this tale. Gibson asks for help proving his children’s governess, Miss Grace Dunbar, is innocent of the charge of murdering his wife. Maria Pinto Gibson, a native of Brazil. She is discovered shot through the head. A gun matching the slug with a single bullet discharged is found in Miss Dunbar’s closet. Holmes soon discovers means to prove Dunbar had nothing to do with Mrs. Gibson’s death. What happens when Holmes in the triumph of explaining how Mrs. Gibson met her end at Thor Bridge and Clemens tells him in no uncertain terms that he is wrong? !